Debunking Christianity: What Is Bad Theology? Why is bad theology so common, and good theology so rare—assuming there even is such a thing? Because theology exploits the free reign of human emotion, as it finds expression in visions, prayers, revelation, meditation, trances, scripture, the insights of seers and god-experts; both good stuff and really awful stuff has been the product of these religious experiences. Anything that anyone comes up with, under the influence of religious fervor, is fair game to plug into theological systems. Commonly, bad theology prevails. Here are some suggestions about the stuff that should be jettisoned. ●	Anything that looks like rationalization of Stone Age barbarism, e.g., human sacrifice, especially the death of Jesus, to allow people to get right with god, is bad theology. ●	Bad theology projects the worst aspects of human personality onto deities, e.g., a god is angry or jealous. ●	Bad theology claims to know more than we do know or can know, e.g., “God exists outside time and space.” How would anyone know that? ●	Bad theology pretends to know about god(s), but fails to demonstrate, beyond a reasonable doubt, that its sources of knowledge of god(s) are reliable and verifiable. When I pick up a book about theology, I want to read on page one how the author knows what he is about to tell me about God. But theologians usually skip this step. If they talk about god(s) based on the Bible, prayer, visions, revelations or mediation, I suspect that bad theology is not far behind. ●	Bad theology assumes the validity of personal opinions and feelings about god(s). But personal opinions and feelings count for nothing when we’re trying to figure out how the Cosmos functions. Individual believers and worshippers are even more prone to bias, emotion and guesswork than the theologians. ●	Bad theology claims that it doesn’t need verification beyond faith and prayer—and that people who want verification are shallow or arrogant. ●	Bad theology commonly caters to wishful thinking and narcissism, e.g., everything is part of God’s plan….and he is listens to my prayers. “My god runs the universe” does not align well with “My prayer will get him to cure my mother’s cancer.” He has to be asked or coaxed? No evidence—other than personal feelings—is provided to support this tactic. If it’s magical thinking, it’s bad theology. ●	Theology that looks like it emerged from a twisted, fanatical mind is overwhelmingly likely to be bad theology, e.g., the apostle Paul and some of the basics of Christianity; Joseph Smith and Mormonism….need I say more? ●	Bad theology comes up with sophomoric excuses for why God allows so much suffering and evil in the world, e.g., God punishes people, gives them pain to improve character; God is let off the hook because we have free will, he has a rival (the devil) who causes all the trouble; or even, God can’t help it. All of these excuses are deeply flawed. ●	Bad theology makes promises about what will happen to people when they die. People are commonly terrified by the prospect that, at death, consciousness ceases forever; they don’t like the idea of oblivion. Religions have, throughout history, traded on such fears—John 3:16 could be Exhibit A. They offer promises or threats about the afterlife based on no evidence whatever: the intuitions—and craftiness—of priests and prophets just aren’t good enough. In fact, the afterlife pitch is an aspect of theology that is unconscionably immoral. People make decisions on how to treat—and abuse—other people based on their certainties about the afterlife. ●	Theology that looks like it is anchored to—and promotes—prejudice, racism, slavery, contempt for indigenous populations, and territoriality is bad theology. John 3:16, by the way, is exclusionary theology: if you don’t believe in Jesus, you’re outta luck. ●	‘God of the gaps’ is bad theology: phenomena that cannot yet be explained are credited to God. We cannot yet explain cosmic origins—what ignited creation?—but cosmologists keep searching for answers because ‘God did it’ is no answer at all. ●	Theology that glories in ignorance—it can’t come to terms with advancing human knowledge and the findings of science—cannot be good theology. Timothy Ferris chose an appropriate title for his brilliant 1988 book, Coming of Age in the Milky Way. We have been coming of age during the last two hundred years especially. It’s no good trying to pretend that Edwin Hubble’s 1923 discovery about the expanse of the Cosmos (the Milky Way is just one galaxy among billions) didn’t change the way we are compelled to contemplate the Cosmos and our place in it. The knowledge revolution of the last two centuries has repeatedly put theology on the defensive. 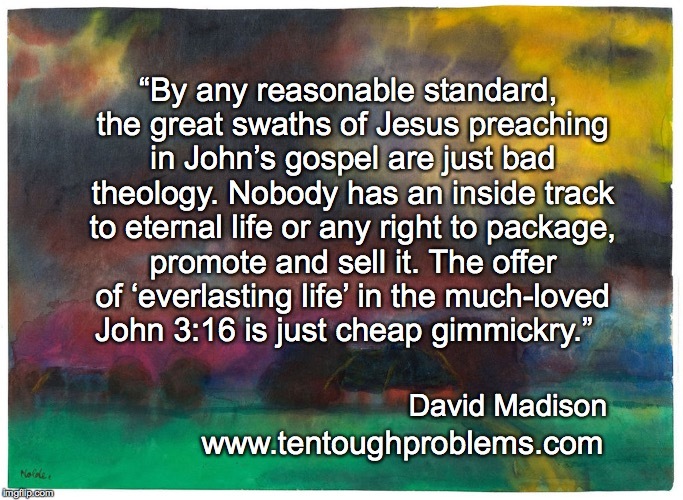 The ad hoc justifications have multiplied, and the result is usually bad theology in full retreat. 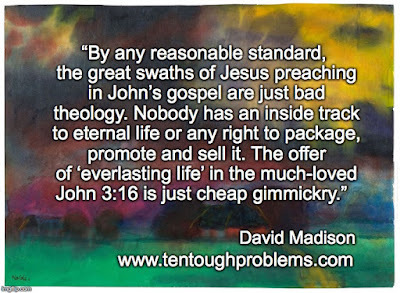 David Madison was a pastor in the Methodist Church for nine years and has a PhD in Biblical Studies from Boston University. His book, Ten Tough Problems in Christian Thought and Belief: a Minister-Turned-Atheist Shows Why You Should Ditch the Faith, was published by Tellectual Press in August 2016.